Last Friday, I shared a ballgown inspired by the late 1860s, but today I have a winter walking costume inspired by the 1820s pelisse like this one from 1822, this one from 1818 and this one from 1825. 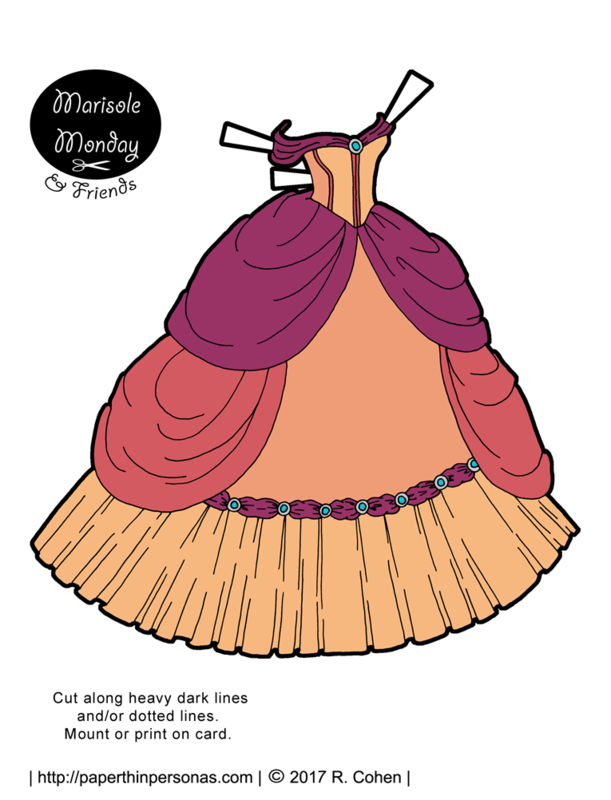 It is the companion piece to last week’s printable paper doll dress. The pelisse from 1822 was the one that was today’s paper doll gown’s strongest influence. I went back and forth about the color scheme for a while, but I really wanted to do something in the red family. As it happens, I super like red. Monochrome color schemes aren’t something I do much, but maybe I should play with them more. I find I often go back to the same colors for paper doll clothing over and over again. I was trying to get all my wintery paper doll stuff backlog taken care off before it gets too warm, but frankly the weather has been freakish. It keeps switching between Spring, in the 70s, and Winter, in the 30s and 40s. I don’t really care which one it chooses, but I dislike having to check my phone every morning to see if I need to grab my coat. That’s enough complaining about Alabama’s wacky spring weather. Meanwhile, if you want to support the blog, then think about donating through Patreon. I’ve opened up two example behind the scenes blog posts one with sketchbook photos and one where I talk about how I decide what to work on, so if you like those then seeing more just costs a dollar a month. Need a Marisole Monday & Friends Lady Paper Doll to wear today’s outfit? Pick One Out Here. So, this is like research rule 1: Write Down Your Sources. And normally, I am super diligent about recording everything I use in Pinterest, so I can find it again when it comes time to write one of these fascinating blog posts. This time though? So much of the not so much. I have a distinct recollection of look at a fashion plate which I think was late 1860s (because that’s when waists when up and skirts got all conical), but now for the life of me I can’t find the plate that was my inspiration. Clearly, I am a bad librarian. Needless to say, I hope I can distract y’all from my poor research habits by pointing out: Hey, there’s a pretty ballgown over there. The truth is that I never meant for this to be a historical piece. It was part of a series of dresses in this silhouette that I designed back when I was doing the same theme for a whole week. I ended up just coloring two of them and you’ll see this one today and next Friday there will be a matching winter walking costume. 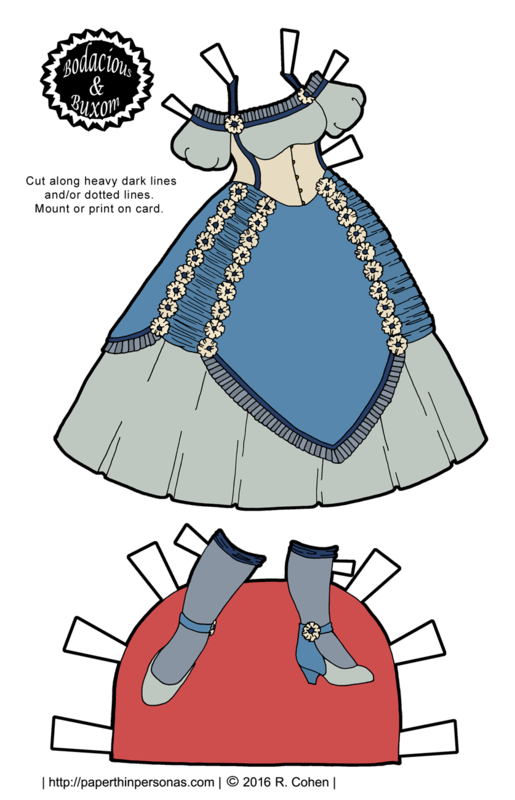 While the dress was inspired by a fashion plate from the late 1860s (I think), it looks much more 1820s to me, since I narrowed the skirt quite a bit. Meanwhile, if you love the blog, then consider following it on Facebook or donating through Patreon. There’s still my Reader2017 coupon running in the Etsy store good for 25% off. Sometimes, I create paper doll clothing set and then I forget about them. This happens to me with disturbing regularity. So, I could have sworn that I posted these gothic paper doll Sprites outfits back in November of 2016. As it turns out, I had them totally done, but didn’t get them formatted or saved as PDFs. So, clearly my memory was deeply flawed. Here they are in today all their gothic paper doll fashion glory. Better late than never. When I dabble in gothic fashion, I try to create things that are interesting and not all black. 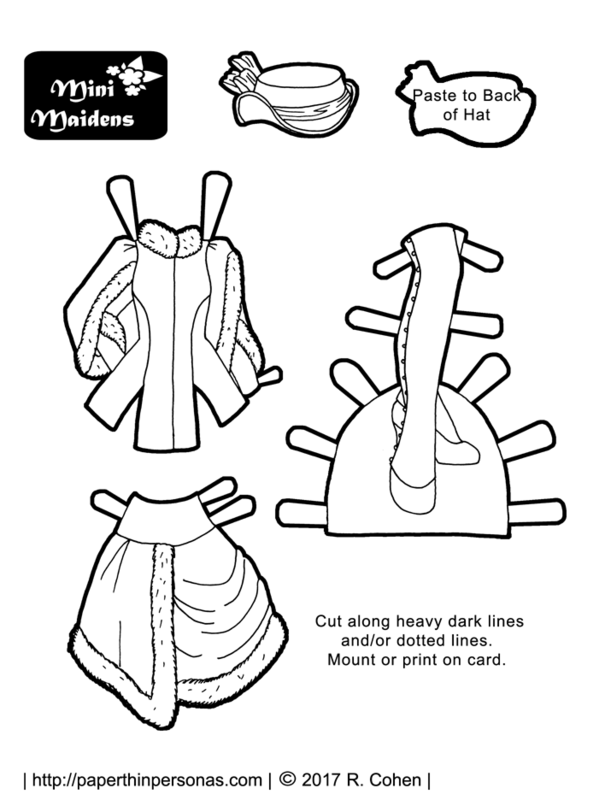 Black is a challenging color for printable paper dolls, because printers have varying sensitivities to it. So, sometimes the tones are too dark and other times they are too light. I try to find a compromise by using several different shades of black in the same outfit which keeps the outfit from feeling flat. The other big challenge of the Sprites printable paper dolls is the fact that they exist in pairs. Every lady printable paper doll outfit is accompanied by a gentlemen’s printable paper doll outfit. This symmetry is both part of the fun and part of the frustration. In today’s gothic fashions, I gave the Lady Sprites a black and purple scheme. The Gentlemen Sprites have a black and red color scheme. 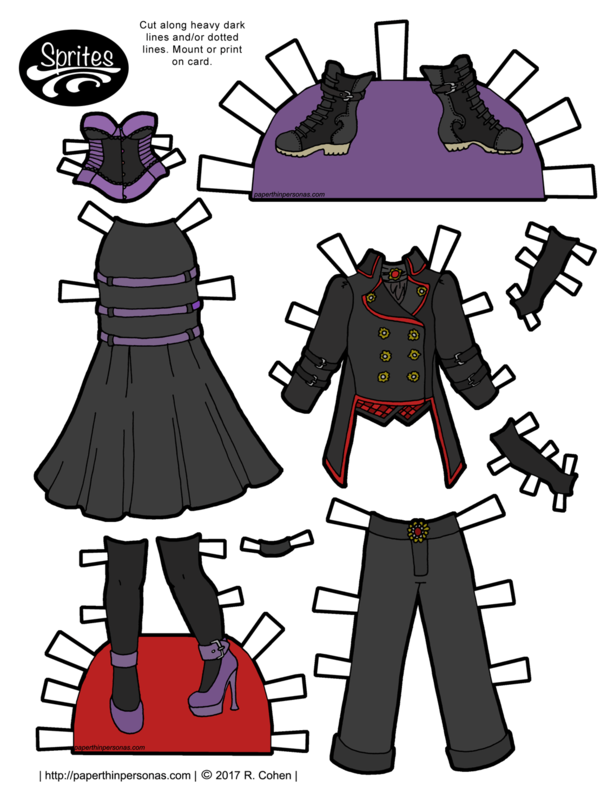 This is the last Sprites printable paper doll set from my stash. So, I have to get working on finishing some things in progress for March. The problem with a strong backlog is that it lulls me into a false sense of confidence. Meanwhile, if you love the blog, then consider donating through Patreon. There’s still my Reader2017 coupon running in the Etsy store and the blog has a facebook page now. Looking for some Sprite paper dolls to wear these outfits? Pick out Sprite paper dolls here. I love big skirted ballgowns. I love crazy over the top big skirted princess paper doll ball gowns. Obviously, I am expressing this love today. Another love of mine, from when I was a kid, are off the shoulder dresses. Generally, I blame this on being a child of the 1980s. This ballgown was actually part of a set of two big skirted fantasy gowns I designed back in 2015. Yes, that’s right, 2015. A long long time ago, I confess. Now, the color scheme it had back then involved lime green and orange, so that had to go. Once I had it re-colored, I actually thought it was pretty beautiful, so it wasn’t a hard decision to repost it. So, how do people feel about big skirted ball gowns? And think about becoming a patron if you like the blog. Every little bit helps, plus there’s previews and sketchbook content. And, I’ve got a new facebook page, so like it and such if you want. It’s home to archives posts from the depths of the blog. So, back in 2013, I started a project called Greta’s Steampunk Trousseau. The idea was to draw the extensive ladies wardrobe of the 19th century in a steampunk style. 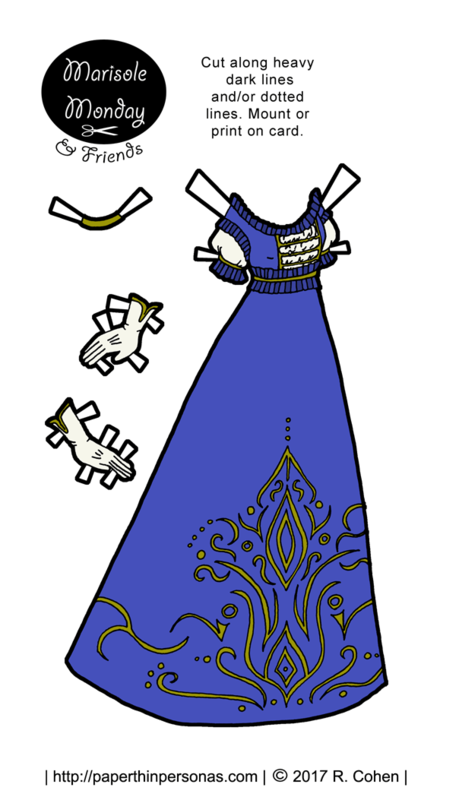 I added steampunk costumes to Greta’s Trousseau until about 2015 when I lost interest in the project and moved onto other paper doll things. But, earlier this month, I was panicking. That the end of January was near and I didn’t have any Mini-Maiden paper doll posts ready for February. Searching for something to post, I discovered this wintertime steampunk costume which I had created for Greta’s Trousseau. And then a through search of my archives informed me that I hadn’t. So, because I am not one to waste a perfectly good paper doll outfit find and because everyone needs thigh high gaiters, I cleaned it up and here it is today. An elegant, but practical, promenade toilette for the colder months of the year. The jeacket has draped sleeves trimmed in fur, a high collar and a longer silouette with provides additional protection from the chilled air. The draped skirt is trimmed in fur. The long gaiters provide needed protection against winter mud and muck, while also being a practical alternative to high boots. The hat is a simple style and trimmed in wide ruched ribbon. In case you doubt how old this design is, here’s the doodle it was based on from 2014. So, should I take on another long term project like this? I have a few ideas for one which I am letting my Patrons vote on right now. So far the things that have been bouncing around in my head range from another steampunk thing (I do love me my neo-Victorian stuff) to a alien space princess. Everything is better with Alien space princesses. Thoughts from y’all? Is another long term thing like this a good idea? Let me know in a comment. Meanwhile, if you want to vote, then become a patron. Plus, the blog has a facebook page now which is pretty neat. 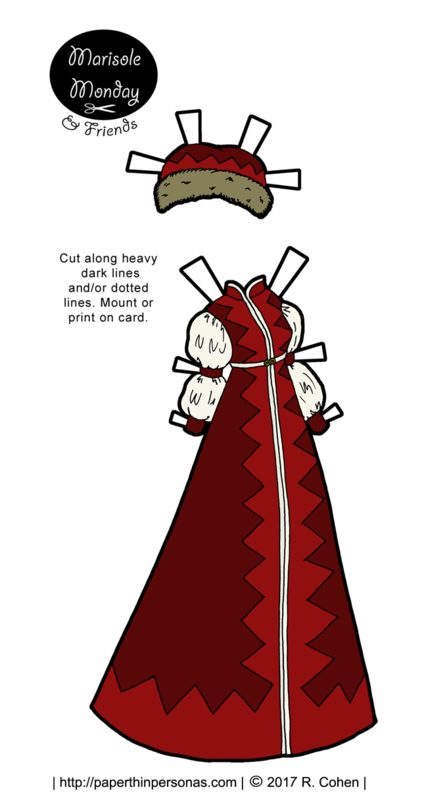 I have never done a Christmas paper doll before. The way I’ve always figured it, there are plenty of Christmas paper dolls and I didn’t see much I could add to the genre. But since I have switched to a daily outfit posting schedule, I figured I might try it this year. 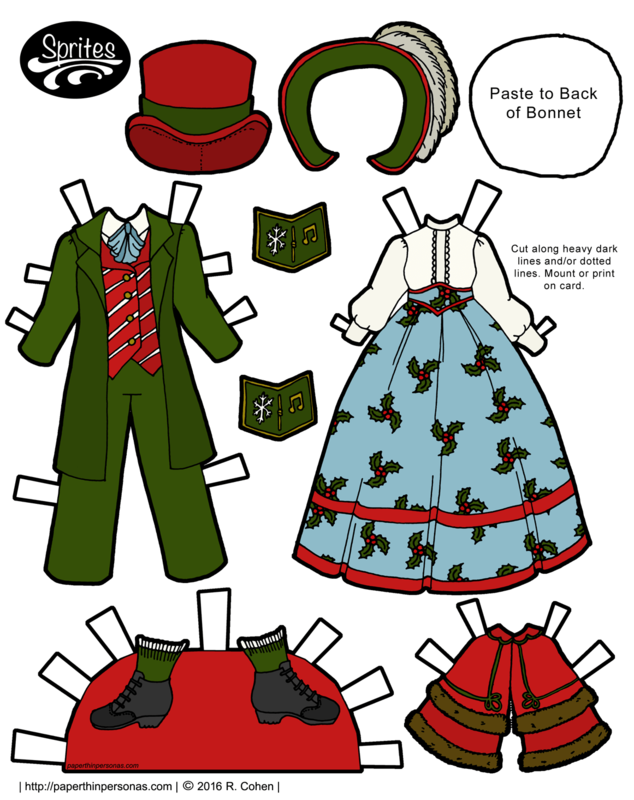 So, today we have some Dickens caroling costumes for the Sprites printable paper dolls. Dickens wrote the Christmas Carol on 1842, but there’s nothing historically correct about these outfits. In fact, I refused to do any historical research, though I did Google “Dickens Caroling Costumes” to get some ideas. Some of the college students I work with would call that research, but I try not to think about that too much. In fact, I would call these costumes and not clothing, because they aren’t historically correct in anyway. I knew I wanted the lady to have a bonnet and cape and for the guy to have a top hat. Beyond that, I just had fun. I chose a holly pattern for the skirt, because I thought it was holiday and old fashioned without being too obvious. Anyway, tomorrow is the first night of Hanukah and Christmas is on Sunday, so I would like to wish everyone who is celebrating either a really wonderful holiday. And for those who aren’t celebrating, I hope you have a great weekend with, or without, family. Victorian inspired madness today. Madness! Okay, maybe not madness… but this is a pretty over the top Victorian corset ball gown creation. Still, if you spent any time with Victorian fashions, they do get pretty over the top. But here’s my thing, I figure the B&B series stands for Bodacious and Buxom. What is more bodacious than a ball gown covered in three types of trimming? Meanwhile, I am going to stick with my slightly sedate (as much as this dress could be called sedate) version here. Somehow, despite the rosettes, with these colors, this dress reminds me of winter skies. The actual “winter” themed paper doll set for the day will be up Friday. There are carolers and my first ever Christmas paper doll. Also, am I the only person who thinks “ball gown” should be one word and not two? Seriously. Like the blog? Think about donating and becoming a Patron, following the blog on Twitter, leaving a comment, and/or telling a friend about it. Need to get a Bodacious & Buxom paper doll to wear these fabulous clothes? Pick one out here.